I’ve been feeling weird lately, and also having some bizarre dreams. I don’t know what it is, but I kind of feel like I’m paddling around in what I think is my Grandma’s pool but is actually the ocean? Like my body and mind are out of sync, maybe. Generally just kind of off my game, as of late. Does that ever happen to you? Could that bit of bad ricotta be to blame? Or maybe the full moon? Newman? Maybe the news of Wisconsin’s first-round loss in the (NCAA basketball, for all of you normal unfortunate people without a Badger-obsessed father) tournament is responsible for my funk. My own personal sort of March Madness. I don’t know, but it’s weird, this feeling, and I need to figure out a way to shake it. Brisk walks along the water (bonus points for a walk that ends with a trip to Swensen’s for ice cream). I hate to admit this, but green juice. It makes us feel good. And until we buck up and spring for a juicer, $9 for “local, organic, cold-pressed” juice will have to be acceptable. …Yes, I too can hear myself. Oy. (Finally!) Starting season 1 of Downton Abbey. Lord Grantham rules. Instagram. Can’t get enough. Sorry I’m not sorry. 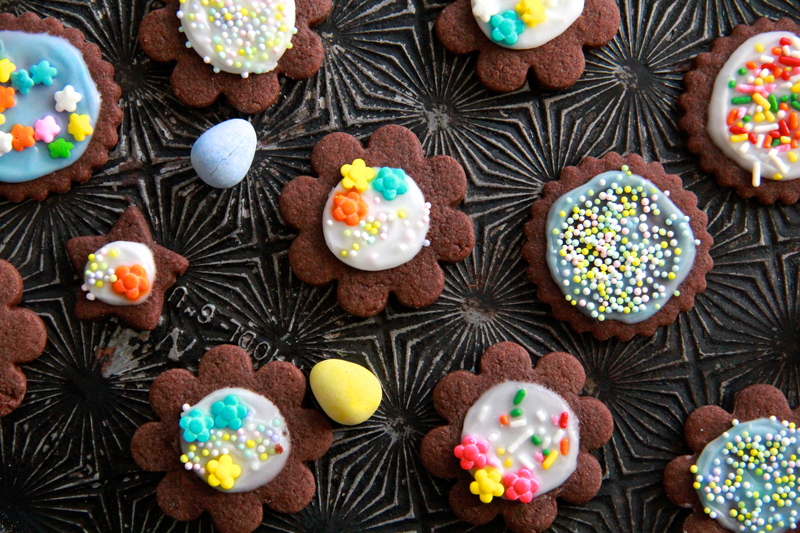 Baking cookies with a fabulous friend. 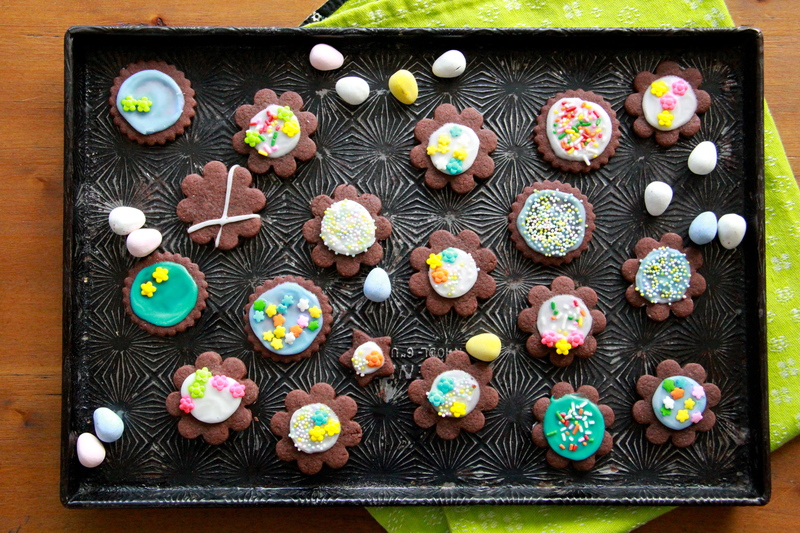 Chocolate ones, all dolled up for spring. Alright, funk. We’ve got cookies now. Get lost. On first bite, I was a little nervous that these wouldn’t be chocolatey enough — but it’s a Smitten Kitchen recipe, so I should have known better. The chocolate flavor deepens as you chew these little guys, and they’re great on their own, but if you want to dress them up with a bit of vanilla glaze and a few sprinkles (or, as Deb suggests, make them part of the perfect ice cream sandwich), I won’t be the one to stand in your way. Heat oven to 350 degrees. Whisk together the flour, salt and baking powder in bowl and set aside. Cream butter and sugar together in a stand mixer with the paddle attachment. Add eggs, vanilla and cocoa and mix well to combine. Gradually add in the flour mixture, and mix until dough is smooth and dark brown. Wrap in plastic and chill for at least one hour. Roll out cookie dough about 1/4-inch thick on well-floured counter. Cut into desired shapes, (re-rolling dough scraps is fine) then bake on a parchment-lined baking sheet for 8-10 minutes, until the edges are firm and the centers are puffed and still slightly soft. While cookies cool, make the sugar glaze/icing: whisk together the confectioner’s sugar, vanilla, lemon juice and 1 tablespoon of water, until smooth and shiny. Add more water by the tablespoonful if it’s looking/feeling too thick. It should be thin enough to spread onto the cookies but thick enough not to run. If you’ve accidentally over-thinned it with too much water, just whisk in some more sugar. Mix in a few drops of food coloring, if you like. The icing will harden quickly, so cover the bowl with a damp paper towel to prevent it from drying out too fast. 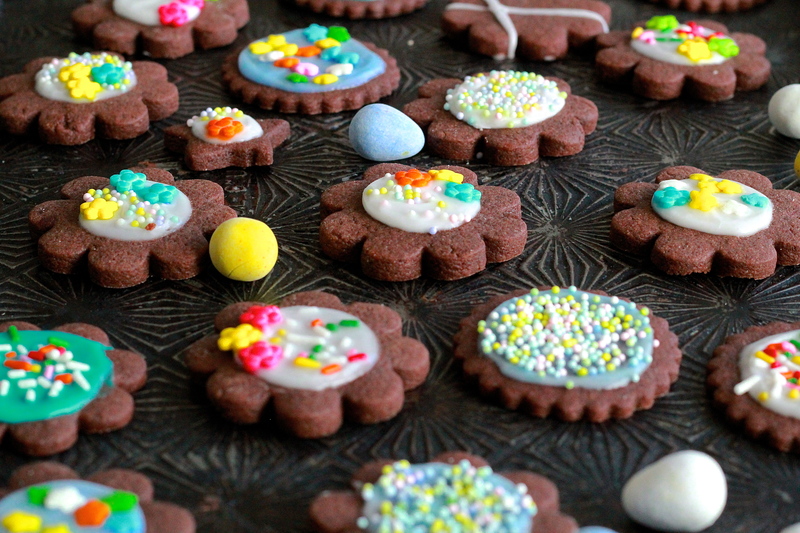 Frost and decorate the cooled cookies until the cows come home/you get hungry for cookies. 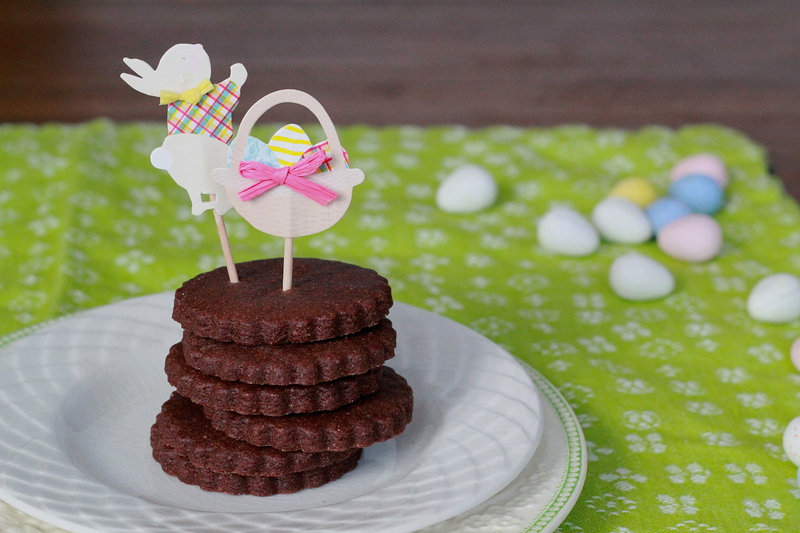 Makes lots of 1-inch round cookies – about 4 or 5 dozen.